Bilateral ties could get a boost during the U.S. president’s upcoming trip there. A widely anticipated trip by U.S. President Barack Obama to Vietnam later this month has raised expectations to unprecedented levels among the boffins in the politburo. Relations between the old Cold War foes have never been better, and that should be a concern to China. Ties struck a friendly peak last July when Vietnam’s Communist Party General Secretary Nguyen Phu Trong made an historic trip to the United States, a first by a Vietnamese Party chief. The results are being felt on the ground and potentially at sea. Vietnam and the United States are now working to clean-up vast tracks of real estate still poisoned by the chemical fallout of their war–a sore point in relations for many years–and U.S. Defense Secretary Ash Carter says he will support a lifting of restrictions on the sale of weapons to Hanoi. If that occurs during Obama’s visit then a shift in the balance of power within Southeast Asia, which includes a military tie-up with the Philippines, will be almost complete and not to China’s liking. Divided by the South China Sea–known as the East Sea in Hanoi and the West Philippine Sea in Manila–Vietnam and the Philippines have never been close. Communist insurgencies in and around Mindanao and North Vietnam’s alliance with the Eastern Bloc during the Cold War ensured relations were put on ice where they remained for decades after South Vietnam was annexed by the communists in Hanoi 41 years ago. Those terms changed with China’s enforcement of its nine-dash line, a policy that encompasses Vietnamese claims over the Paracels and Philippine claims over the Spratlys, and has added a fillip to already rapidly improving ties between Hanoi and Washington. A ban on lethal weapons sales to Vietnam was partially lifted in October 2014 to help the country patrol its waters amid escalating tensions in the South China Sea. The following year, the two countries marked the 2oth anniversary of the reestablishment of diplomatic relations, achieved largely by former President Bill Clinton. Washington has also promised Vietnam $18 million to bolster its coast guard with U.S.-made patrol boats. But in terms of Vietnam’s overall needs, this is tiny and it is widely understood that Hanoi wants access to U.S.-made airborne systems. It’s a difficult recipe. Chinese relations with its neighbors are uncomfortable at the best of times. Beijing has managed to win some kind of commitment from Cambodia, Laos and Brunei not too interfere in the maritime dispute. But these countries are hardly key regional heavyweights and the Cambodian government has made it quite clear since 2012 — when it split with ASEAN over the maritime dispute — that its allegiance belongs to the impoverished nation’s biggest benefactor. 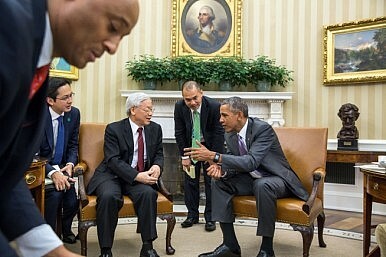 Le Hai Binh, spokesperson for the Vietnamese foreign affairs ministry, said Obama’s visit would raise relations between the United States and his country to a new level. The biggest obstacle to a removal of restrictions on weapons sales is Vietnam’s atrocious human rights record. Late last month, Tan Thi Hong, the wife of detained pastor Nguyen Cong Chinh was reportedly beaten by local authorities while on her way to meet with the U.S. ambassador at large David Saperstein to discuss international religious freedom. She was also prevented from meeting with Saperstein. However, Hanoi has used jailed dissidents as a bargaining chip before and released several prominent activists ahead of talks with the United States before signing off on the Trans-Pacific Partnership (TPP), a trade deal that favored Southeast Asian countries but excluded China. Dates are yet to be finalized but according to the official Vietnam media, the visit will be organized around the next G7 summit on May 26 to 27 in Japan. Efforts at Agent Orange decontamination reinforce the work that continues to go into addressing old challenges even as both countries seek to maximize new opportunities. Mekong Disaster Drills Highlight US-ASEAN Subregional CooperationUS-ASEAN Defense Ministers’ Meeting Kicks Off in HawaiiA US-ASEAN South China Sea Failure at Sunnylands?Obama Will Visit Vietnam in May 2016 to Boost TiesCould Vietnam Have Avoided the 1979 War With China?